This nourishing Breakfast Green Smoothie recipe is the perfect way to start your day. 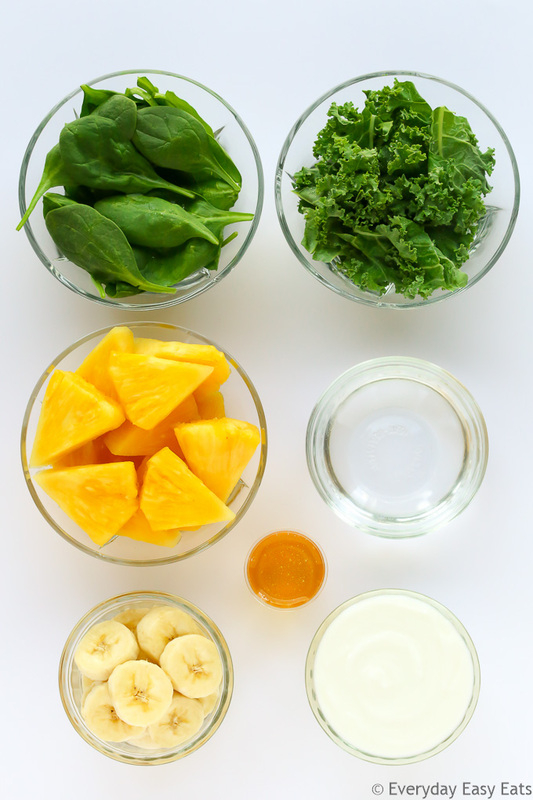 A delicious, satisfying shake made with kale, spinach, pineapple, banana, Greek yogurt and honey! I know I am not the first person to tell you that breakfast is the most important meal of the day. It is vital to have a healthy, energizing breakfast like this quick Green Smoothie to kick-start your day and get your metabolism going. The characteristic green color of this smoothie comes from adding two good handfuls of spinach and kale. Spinach and kale are both superfoods, meaning that they are nutrient powerhouses that are packed with vitamins and minerals. Both spinach and kale are rich in iron, Vitamin K and Vitamin A.
Pineapple, banana and honey naturally sweeten the shake so that it doesn’t even taste like you are consuming green vegetables. Finally, Greek yogurt adds creaminess and a good dose of protein. Feel free to customize this recipe by adding a scoop of protein powder or some ground flax seed or chia seeds to make your smoothie even healthier. Simply add all of the ingredients – water, kale, spinach, pineapple, banana, Greek yogurt, and honey – to a blender and blend until smooth and creamy. Tip: When adding your ingredients to your blender, always add the liquid (in this case, the water) first near the blades. Doing this will help your blender to run a bit more easily whenever you are making a shake. Using a Vitamix Blender, because it is the BEST blender for making smoothies! A Vitamix is a high-powered blender that breaks up frozen fruit, leafy greens, dense vegetables and any other crunchy ingredients into oblivion – with no chunks and easy clean-up. Best of all, the blender is super versatile, so you can also use it to make soups, sauces and homemade nut butters. 🙂 You can check one out on Amazon here. SO GOOD! I cut the recipe in half and used agave instead of honey, it was divine. Totally my new recipe for breakfast. Hey Louisa! Thanks so much! I’m so glad you liked the recipe!